Are you ready to start chasing your dream, but you’re not sure what to do first? If so, I believe I have a word from the Lord for you today about how to give wings to your dreams. I have so many ideas for what to do with writing and with the mission/ministry work that I do. So many ways I’d like to volunteer to help at my church. So I’ve been praying and asking the Lord to order my steps. And last Friday morning, May 27, I had a dream just before I woke up–a dream that I knew contained the Lord’s direction for me about what to do next. It was so beautiful and simple, yet very powerful, so I wanted to share it with you too. First, I’ll share the dream, and then I’ll give the interpretation and application below. In the dream, I was in the dining room of my old house–a house I lived in as a child. It was daytime, and light was shining brightly. One whole wall was solid windows, and there was a dining room table there made of yellow and white formica. I dreamed I had a parakeet (also known as a budgerigar or “budgie”) that should have been dead long ago. He was in a cage, and I hadn’t fed him or watered him in months. Somehow, though, he was still alive … but just barely. I noticed him, took him out of his dirty, smelly cage, and carefully placed his beak up next to some clean water. He sipped the water as I fed him by hand, and he revived. Then I put him in a big, clean cage in front of a big window in the dining room of my old house. Then I found another bird, and another, and another … all in my dining room. I noticed just one bird at a time. Several of the parakeets were in the same condition as the first; I had not been feeding or watering them. However, as I picked them up and took care of them, they all revived. And even though I didn’t have cages for them, an appropriate cage/house appeared for each bird out of nowhere, just when I needed it. And a couple of parakeets that had not been fed or watered for months … but still they lived on. All the birds except the parakeets were healthy, and they appeared out of nowhere. And the healthy birds appeared after I rescued the parakeets. As I picked up each bird and placed it in its cage, I stacked the cages next to the window. And I knew in the dream–the kind of knowing that only comes from the Holy Spirit–that I was to sell each bird; that the birds were being given to me to get my husband and I totally out of debt. The birds kept appearing out of nowhere. Toward the end of the dream, I counted them. There were about 40 birds of many different kinds–many parrots, but other kinds of birds as well. They were all beautiful, and had bright, gorgeous feathers. All the birds were friendly, too! They all let me hold them in my hand, even if they should not have been friendly if you saw these birds in the wild. Then there was a crow named Poppycock. Only one of the birds wasn’t beautiful. There was a crow. In the dream, instead of putting him in a bird cage, I put him in a cat carrier instead! This crow was a talking bird. His name was Poppycock, and he talked to me. He was nice, but I didn’t want a crow! I put him in his cat carrier and forgot about him. Then, later, I noticed him again and set him free outside to get rid of him. Throughout the dream, the smallest birds were the ones I hadn’t taken care of–but they lived and revived as soon as I gave them water and food. The small, starving birds appeared first, and I took care of them first. A parakeet isn’t worth very much. You can buy one in the US at a pet store for about $20. But the parrots were very expensive. They range in value from the hundreds of dollars to the thousands of dollars. The big, rich birds appeared out of nowhere, fat and for the taking – like the yellow lori. They were perfectly healthy. God created them out of thin air after I started taking care of the emaciated little parakeets. None of the birds’ wings were clipped, and I didn’t clip them–although I thought I might need to when I prepared to sell them. At one point in the dream, one of my spiritual sons came and stood in front of my wall of bird cages to see these birds that had appeared out of nowhere. As he gazed at the birds, I knew that it was a testimony to him and to others about what God could do to set us free financially. Here’s the interpretation of the dream: The birds represent dreams and career/business/money-making ideas. They have wings. Point 1: The Lord was showing me that I have had many ideas that I haven’t taken care of. These were ideas from Him, but I have neglected them. These ideas may not look glamorous, and they may not produce tons of money, but they are key to my foundation. I need to get these ideas out, feed them, and take care of them. Point 2: The big, most beautiful, expensive birds showed up out of nowhere after I took care of the emaciated birds. From this, the Lord told me that, after I take care of the basic, foundational ideas He has given me, my obedience will make a way for Him to drop very profitable, fat ideas into me out of nowhere–ideas that don’t need a lot of caring for; they will be ready to bring in income right away! Point 3: In the dream, I knew that the most expensive bird was the $2,000 yellow lorikeet. In Biblical symbolism, the color yellow represents a renewed mind, hope, and courage. I knew God was saying He is giving me hope for abundant financial freedom. Point 4: It’s important that the lorikeet was a lorikeet. Why? Lorikeets are special because they have a special tongue that is made to drink nectar. They drink nectar! And Jesus is like sweet nectar. The Holy Spirit is sweet nectar. The most expensive ideas come from dwelling in the secret place of the Most High and drinking the sweet nectar of Jesus! Point 5: In the dream, my son came and looked at what God had done. It was a testimony to him. I believe this means that the freedom God is bringing will be a witness–a testimony, a sign, and a wonder–to the generations to come. Point 6: The word “Poppycock” means “lies.” When you say, “That’s poppycock!” it means “That’s a lie!” In the dream, “the lies” talked really nicely to me and sounded sweet, but I knew there was no place for them in what God was doing. I kicked the lies out the door. We need to kick all the lies out the door … and if something isn’t gleaming with hope and beauty, it’s a lie! Don’t tolerate any lies! Point 8: The birds’ wings weren’t clipped. This means the ideas aren’t limited. Their potential is not limited. They can fly and soar high! Point 10: It’s also important that the dreams were in front of windows. There is an open Heaven over us and Papa has opened the heavens to bless us. Second Corinthians 1 says that any word of encouragement that God gives to one person is meant for all believers. So, this dream is for you too–just like it is me. What ideas do you have that you have neglected, cast aside, or let lie in the dark? Don’t let yourself get under condemnation about those ideas. Just make a list! Several articles the Lord has given me that I have, just, you know, not done anything with–including one for a national magazine that the editor even invited me to submit! 🙁 And it’s already written! And I haven’t done a thing with it! Books and CDs that I need to have printed, to offer in print form as well as downloadable form. My own book that I need to finish. What does your list look like? Write it down! Then, one day at a time, start working on one thing at a time from that list. Start with the most basic, least-glamorous ideas. Those are your foundation. Even if you knock them out in 10 minutes at a time, just plug away at them. Don’t worry about it being too late for your ideas. In the natural, those ideas maybe should have been dead–but God has sustained them. They are still breathing, and they’ll revive as soon as you get them out and feed them. As you are diligent to rescue those old ideas that have been starving, I believe God is saying that He will drop more ideas, and more profitable ideas, out of nowhere. But one important thing: Get rid of the lies! Don’t allow Poppycock to whisper in your ear, no matter how nice he may seem! He’s a crow, and he eats carrion and gross stuff! Even though he seems nice, he only wants to devour your flesh! Get rid of Poppycock! 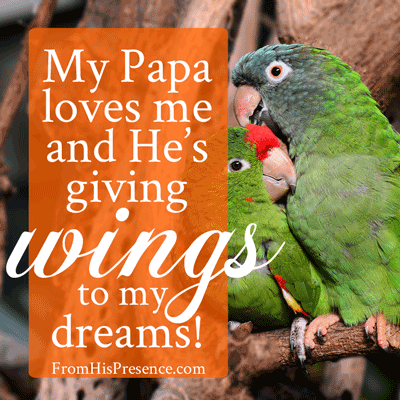 Papa God wants to give wings to your dreams. Are you ready to jump in? Precious brothers and sisters, it’s time. You can do this! One step at a time, the Lord has provided the way already for you to become financially free. It’s time to get started on your list of old ideas. Papa God will provide out of nowhere and build on your foundation as you begin to work through your list. And what He will do for you will be a sign and a wonder to the generations to come. Does this dream resonate with you? If so, please leave a comment below. I’d love to hear from you! Today’s Word comforts and encourages me. I had many plans to bring my message of mental and physical healing with music until our youngest son (31) had a massive stroke last August. Then his older brother who lives at home with us precipitated his first psychotic break in nine years. The last nine months have piled one type of crisis on top of another, most of which have demanded my time, energy, and financial resources to the max. Several of those crises have been life-threatening to our son or to one or another member of his family. All my plans had to be set aside as the Lord guides us through this new territory. Like you, I have produced lots of writing in the wee hours and in moments stolen between paying work and everything else. I can see from your dream that my dream, also, is not futile but that the new learning I have gained about the role of sound in recovery from stroke is “another bird without clipped wings” in my repertoire of stories of hope. Thanks for this beautiful message that resonates with my present circumstances so creatively. Laurna, sister, I just think you’re awesome. I know you’ve been through hell recently, but you’re still hanging in there! You haven’t run screaming from the proverbial building yet! 🙂 🙂 I stand in agreement with you. I believe with you that Papa’s going to breathe new life into your dreams, and that you will find that He will turn the unfortunate delays you have suffered into good and use everything additional that you have learned to make the end result even better. Thank You, Jesus, for Your redemptive purpose for our lives! Last year, as hands were laid on me to pray, the one praying said the Lord had showed her me as a bird whose wings had been clipped…but that He was going to fix them. When I first read this post, something stirred in me about the date you noted, May 27th…just figured out why. It wasn’t the date of the dream I mentioned (at least I don’t think it was, trying to get better at writing down what He says and shows), but in the times following that glimpse, i experienced such opposition that i shut the outside out to press close to Him, pour out my hurt/confusion to Him and seek His heart. Asked Him what He had in mind when He made me. His answer came before dawn on May 27, 2014 – His calling on my life & my identity in Him. Didn’t write it down on paper, but typed it in an email to myself as He spoke it over me with such tenderness…makes me cry now. Thank you Jamie for your obedience and for being, literally with your life, a reflection of Abba’s heart toward us. Abba, Jesus, Holy Spirit, our hearts are the wicks, Your love is the flame and we want to burn for Your name. God bless you Mrs. Jamie you have blessed me with this wonderful prophetic word. I have so many ideas that I want to do but because of not having a job it’s a lot harder for me to get anything done. I write so much now and I am working on a book. Like David said in Psalms, “Oh God, my Lord step in, work a miracle for me, you can do it. I really need God to breathe on my finances, I have no money at all. If you could just remember to pray for me please. Thank you so much for this article and have a wonderful day. I have had this sort of dream, not having fed my dogs. Pets that have been gone for years. I also had one where a parrot got away and I caught it. I see the meaning behind it. And I thought you’d like to know I read the other day that crows will eat songbirds, something I didn’t know. Thank you, this word felt just for me, though I know it is for many! I have had so many ideas and started with doula training, but am stumped with a detail with that. I want to work with women with unplanned pregnancies and teens I also have a real creative desire and want to sell vintage things and have been making jewelry. I’ve been a busy stay at home mom to 4, and haven’t put much effort into my dreams! Thanks for the encouragement! This echoes. I’m going into real estate and sidelined for listening to poppycock. So I used the time kids were out of school to deepen relationships with them and pray about poppycock. Poppycock was factual and convincing and almost cost me my whole life; my marriage, potentially my kids everything I know as my world. The lies were based on truth. That can get tricky. I had to dig deep to get past poppycock. God is faithful and not intimidated by our pain or our path to discovery. He knows what I go through to follow Him and He holds out for me. He is good. In this I’ve learned a lot. His word, his DNA is changing my DNA. It is Him. He is my reason my reward. Birds are just birds and they’re a dime a dozen not to kill the wonderment of the work of God. But the heart of God is all I’m after. Ideas and success and the people along the way are his gift so I can give it all back to Him. Wow. I got deep for a minute. I’m excited to just be. He is so so good. Thanks for sharing Jamie. We used to own alpacas and I made needle felted sculptures with the fiber (I spun the fiber and made knit and crochet pieces too). The cost to keep these animals was too much and the return on the investment was in the negative so we sold them at a loss. I dreamt for years afterwards that I would discover that no one was taking care of the alpacas and they were all dying. I found some of them all shriveled up in the hay dead but some were very weak, thirsty and hungry and close to death. I’d wake up from my dream in a panic. I’d jump out of bed in horror and gasping and even woke my husband up in a panic that no one was taking care of the alpacas. He’d grumble at me and tell me we sold them years ago and to go back to sleep. Now occasionally I’ll dream I find the alpacas all dead. It’s such a sad dream I even wake up crying. We have long since moved from our farm so we couldn’t have alpacas again anyway. We are in no position to have alpacas. I don’t really want alpacas and alpacas have lost their appeal to the US market because the cost to keep and the return is a loss for people. It’s very sad because alpacas are the most adorable and fun loving animals. I miss how adorable and how much fun they were.